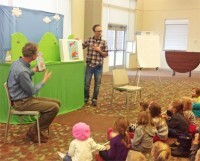 The St. Michael Public Library was honored by a recent visited from author David LaRochelle and illustrator Mike Wohnoutka, along with the traveling trunk show celebrating their award-winning book, "Moo!" Their visit was part of the Once Upon A Reader statewide one-book program designed for Pre-K children to promote early literacy skills.The program was sponsored by the Council of Regional Public Library System Administrators (CRPSLA) and funded by the Minnesota Arts and Cultural Heritage fund. This was the first year of the initiative. About 75 parents, caregivers and children were on hand to check out the antics of Cow, the main character of "Moo!" and her moo-velous adventure with Farmer's car. Kids saw a puppet show featuring Cow, and sang and danced along with music that was specially written for the show. LaRochelle and Wohnoutka also generously autographed the library's copy of the book, and gave the library a "Moo!" poster.